This prophetic Brothers Grimm fairytale is about the supposedly dimmest and youngest of three brothers, who due to an act of kindness, is gifted a golden goose by an old man. The parable is about not being greedy-- trying to pluck a golden feather will only get you stuck in a parade of shame. The boy wins over the princess after many saves by the old man, and of course, they live happily ever after. Do not confuse this story with the far more iconic parable, The Goose That Laid the Golden Eggs (that's a different lesson about greed). 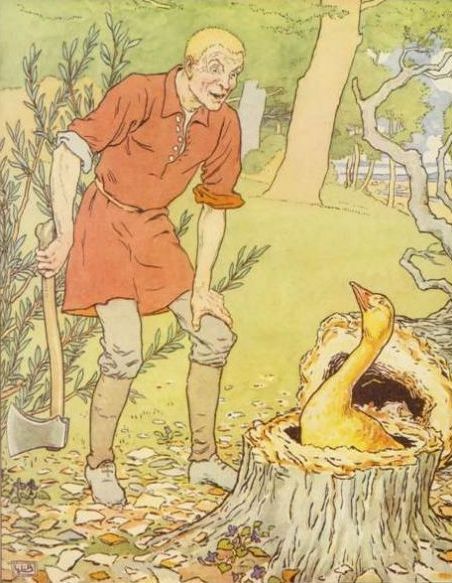 The Golden Goose was published in Grimm's collection, Children's and Household Tales (1812). When he entered the forest there met him a little grey-haired old man who bade him good-day, and said, "Do give me a piece of cake out of your pocket, and let me have a draught of your wine; I am so hungry and thirsty." But the prudent youth answered, "If I give you my cake and wine, I shall have none for myself; be off with you," and he left the little man standing and went on. After this the second son went into the forest, and his mother gave him, like the eldest, a cake and a bottle of wine. The little old grey man met him likewise, and asked him for a piece of cake and a drink of wine. But the second son, too, said with much reason, "What I give you will be taken away from myself; be off!" and he left the little man standing and went on. His punishment, however, was not delayed; when he had made a few strokes at the tree he struck himself in the leg, so that he had to be carried home. Then Dummling said, "Father, do let me go and cut wood." The father answered, "Your brothers have hurt themselves with it, leave it alone, you do not understand anything about it." But Dummling begged so long that at last he said, "Just go then, you will get wiser by hurting yourself." His mother gave him a cake made with water and baked in the cinders, and with it a bottle of sour beer. When he came to the forest the little old grey man met him likewise, and greeting him, said, "Give me a piece of your cake and a drink out of your bottle; I am so hungry and thirsty." Dummling answered, "I have only cinder-cake and sour beer; if that pleases you, we will sit down and eat." So they sat down, and when Dummling pulled out his cinder-cake, it was a fine sweet cake, and the sour beer had become good wine. So they ate and drank, and after that the little man said, "Since you have a good heart, and are willing to divide what you have, I will give you good luck. There stands an old tree, cut it down, and you will find something at the roots." Then the little man took leave of him. The eldest thought, "I shall soon find an opportunity of pulling out a feather," and as soon as Dummling had gone out she seized the goose by the wing, but her finger and hand remained sticking fast to it. At last the third also came with the like intent, and the others screamed out, "Keep away; for goodness' sake keep away!" But she did not understand why she was to keep away. "The others are there," she thought, "I may as well be there too," and ran to them; but as soon as she had touched her sister, she remained sticking fast to her. So they had to spend the night with the goose. The next morning Dummling took the goose under his arm and set out, without troubling himself about the three girls who were hanging on to it. They were obliged to run after him continually, now left, now right, just as he was inclined to go. In the middle of the fields the parson met them, and when he saw the procession he said, "For shame, you good-for-nothing girls, why are you running across the fields after this young man? is that seemly?" At the same time he seized the youngest by the hand in order to pull her away, but as soon as he touched her he likewise stuck fast, and was himself obliged to run behind. Before long the sexton came by and saw his master, the parson, running behind three girls. He was astonished at this and called out, "Hi, your reverence, whither away so quickly? do not forget that we have a christening to-day!" and running after him he took him by the sleeve, but was also held fast to it. Soon afterwards he came to a city, where a king ruled who had a daughter who was so serious that no one could make her laugh. So he had put forth a decree that whosoever should be able to make her laugh should marry her. When Dummling heard this, he went with his goose and all her train before the King's daughter, and as soon as she saw the seven people running on and on, one behind the other, she began to laugh quite loudly, and as if she would never leave off. Thereupon Dummling asked to have her for his wife, and the wedding was celebrated. After the King's death, Dummling inherited the kingdom and lived a long time contentedly with his wife. Add The Golden Goose to your own personal library.